I have a very wide vision for this blog and the concept of a Cancer Victory Garden™. 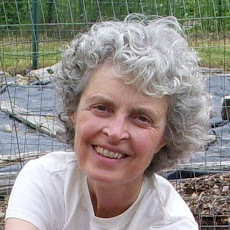 I am fortunate to be using my gardening experiences during the on-going recovery from my own cancer therapies. However, caring for my garden, nurturing new life, is also very important to me because having my hands in the soil both physically and spiritually connects me to all who have gone before me. Having personally experienced deep sadness and grief from losing friends and relatives to cancer, memories of both past loss and happiness are part of my every day life in addition to contributing to my deep appreciation and gratefulness for each moment of today. Feeling part of the sacred circle of life comes most easily to me when outside in my gardens, while working the soil and tending the plants with the sun on my back, my knees on the ground, and my hands in the dirt. Thus, I hope this blog will inspire everyone who has been touched by cancer (no matter how, when, or where you are on your personal cancer journey) to get your hands in the soil to first honor life that has been and then cherish and cultivate life for today and life still to come. I'll end by sharing some of my favorite quotations that combine my love of the land, soil, and gardening with the deepest kinship and respect for our soil's life-force that nourishes us all. is the ashes of your grandfathers. is rich with the lives of our kin. A garden is evidence of faith. and were nourished by the fruits of their planting. I recently read a discussion about the use of raised beds to meet the needs of gardeners who have physical disabilities, including those who would need to garden from a wheelchair. Although the question that sparked the discussion related to installing raised beds in public parks, I immediately thought the information provided would be very helpful to anyone considering gardening on the grounds of a cancer center, health care facility, or elder-care residence. I asked permission to reprint the resources and words of wisdom provided on this listserv discussion shared by Dave Wilson of King's Agriseeds in Ronks, PA.
• Primarily the major factors to consider are accessibility, space allowance, height and reach ranges and designing an accessible route especially for someone in a wheel chair. The size of the pathway between the garden beds needs to be accessible by a wheel chair so that a person in a wheelchair can turn around. There can’t be protruding objects or surfaces that would inhibit someone in a wheel chair and the surface path needs to be “improved” or hardened enough so that a person in a wheel chair would not get stuck as in a wet muddy soil. • Beds need to be built up above the ground level with wooden sides to fortify them which then lets you raise the soil surface level up to a height that a person in a wheel chair can reach in and access. • Other planting table beds can be adjusted to a height on a raised bedding table full of soil similar to what we may have in a green house wooden raised table bed that is used to start greens, but the height of the table has to be adjusted so that someone sitting in a wheel chair could reach into the table bed and work by reaching their arm in to seed, transplant, weeding or watering the plants etc. In addition, I just stumbled onto this article, which gives many specifics about garden designs for people using wheelchairs. I especially liked their recommendation that the entire bed be raised with space underneath either for the person's knees or for storing gardening tools. The second recommendation that I really liked was including a chair or bench for a friend! If anyone develops a Cancer Victory Garden™ at their cancer center or other health-care facility, I hope you take this information into consideration and find it useful. 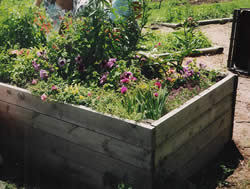 I was so weak and debilitated during my chemotherapy in 1984 and 1995 that I would have loved to have wheelchair accessible raised beds for gardening. I still remember trying to both plant and weed by lying on my side along some of our gardens, because I was too weak to sit up unsupported. I know your patients will thank you!